Get your moneys worth at the Quality Inn and Suites hotel in Niles, MI, located a short drive from the beaches of Lake Michigan and Silver Beach. Attractions near our smoke-free hotel include Fernwood Botanical Garden, Fort St. Joseph Museum, RedBud Motorcross, Studebaker Museum and Warren Dunes State Park. 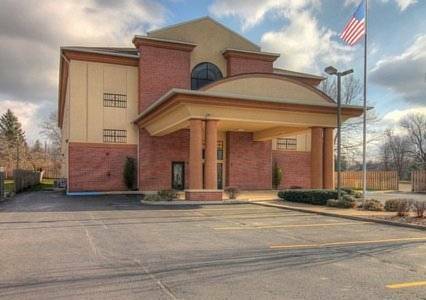 Our hotel features full-service amenities like free breakfast, free WiFi, a fitness center, an indoor heated pool and more. Your guest room features a TV, microwave, refrigerator, coffee maker, hair dryer, iron and ironing board. Select rooms feature desks, hot tubs and kitchen facilities. Also, earn rewards including free nights and gift cards with our Choice Privileges Rewards program. A museum about all the Vice Presidents (it's slogan is "Second to One") with a special section devoted to James Danforth Quayle, who was George Bush 41's VP. Huntington is Quayle's hometown.